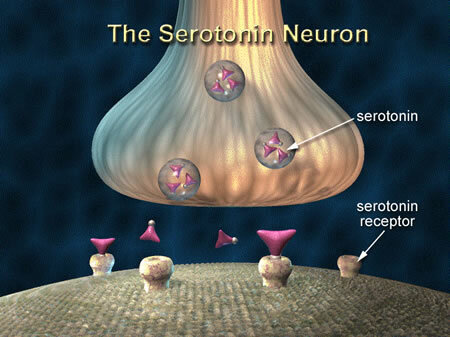 Serotonin is an example of a neurotransmitter, a chemical messenger that is passed between nerve cells. When a nerve impulse reaches the axon at the end of a nerve, neurotransmitters are released which cross an area called the synapse to be received by a specific receptor on the end of a target nerve. Once received by the target nerve, the neurotransmitter may either excite that nerve to fire its own signal or prevent it from firing the signal. Serotonin is an example of an inhibitory neurotransmitter. It is mainly found in the gastrointestinal tract, the platelets and the central nervous system of animals and is thought to contribute to a sense of well being and happiness. 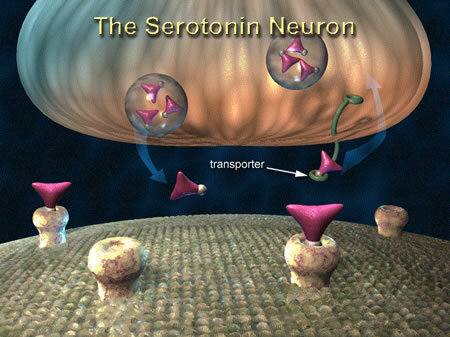 Serotonin is a monoamine transmitter called 5 hydroxytryptamine (5-HT) and is derived from tryptophan. It was first discovered by Vittorio Erspamer in Rome in 1935 and American scientists corroborated the findings in the late 1940s. Serotonin was first isolated and named by Maurice M. Rapport, Arda Green, and Irvine Page of the Cleveland Clinic in 1948. The hormone was chemically identified as 5-hydroxytryptamine later by Rapport and became known of more broadly as 5HT. The majority of serotonin in humans is present in the enterochromaffin cells of the digestive tract, where it is involved in regulating movement of the gut. 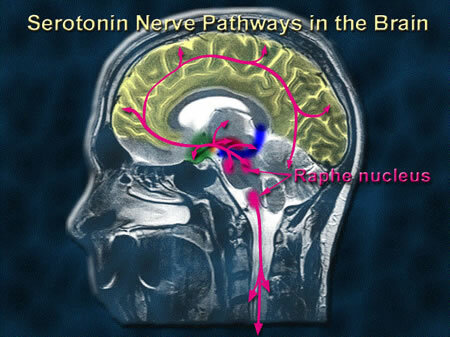 The rest of the body's serotonin is synthesized within the serotonergic neurons in the central nervous system and is used in the regulation of various functions such as sleep, mood and appetite. 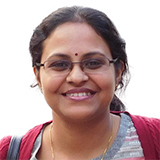 Medications that increase the availability and uptake of serotonin are used to treat depression. Serotonin is also taken up by platelets, which store the hormone. When the platelets attach to a blood clot, they release serotonin which acts as a vasoconstrictor as well as acting as a clotting factor to promote healing.